The Kraco Premium Rubber 4 Piece Mat set features a raised border and ribbed heal pad for comfort and extra wear prevention. Trimmable design makes it simple to customize the fit for any vehicle. Includes 2 front and 2 rear mats. Rib-molded heel pad provides comfort and protection from wear. Diamond Deck<sup></sup> roll out flooring protects your floor, while giving it that stylish rugged look. Simply roll out and you're done. Can be easily cut to any size, with a utility knife or scissors. Use as a parking pad or cover the entire garage floor. Resists oil, gasoline, brake fluid and antifreeze. Diamond Deck<sup></sup> is unaffected by battery acid, making it the ideal golf cart mat. Great for workshops, basements, trailers, laundry rooms, mud rooms, bathrooms, motorhomes and camping. Perfect whether you need a temporary or a permanent flooring solution, that is tough, waterproof, durable and easy to install. Seams can be permanently sealed together, making them waterproof, with our vinyl backer and Oatey X-15 Vinyl Adhesive. 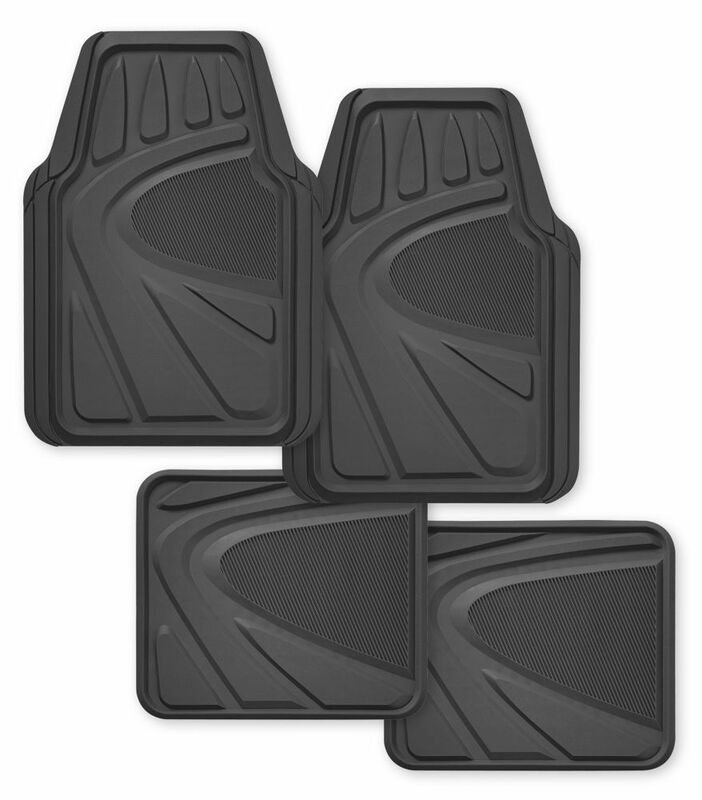 Kraco Premium 4 Piece Heavy Duty Rubber Car Mat - Grey The Kraco Premium Rubber 4 Piece Mat set features a raised border and ribbed heal pad for comfort and extra wear prevention. Trimmable design makes it simple to customize the fit for any vehicle. Includes 2 front and 2 rear mats. Kraco Premium 4 Piece Heavy Duty Rubber Car Mat - Grey is rated 4.7 out of 5 by 6. Rated 4 out of 5 by Anonymous from Durable mats These mats live up to what is advertised. Easy cleaning. Rated 5 out of 5 by David from Trimmable works great. Made for a nice fit. Being trimmable it made for a custom like fit. Some went in good without trimming, but front needed to be cut a little. Rated 4 out of 5 by Wolfie from Rubber Mat Set I purchased this for a CRV to protect the floor and add a layer of protection for a decorative floor mat. The article stunk so bad of rubber when purchased it was hard to keep in the vehicle. However after several months have passed there is barely any smell and the mats are flexible and did not need to be cut to fit. I know have coverage in both the front and back of my vehicle. Rated 5 out of 5 by Chunky from Perfect Choice Car mats match car interior perfectly and have stayed clean and have kept sand from getting under the mats. Rated 5 out of 5 by MarkusL from Simple & good floor mat Needed something for my Nissan LEAF and it was easy to cut into the right shape. Passenger and rear mats did not even need a trim.